Unlimited Nationwide Talk and Text in the U.S. Unlimited Talk and Text to 60+ Countries. First 100MB of data is 4G LTE and is included with this plan. Lycamobile is a T-Mobile MVNO, as such, they piggyback on the T-Mobile network. If you have good T-Mobile coverage in your area, these cards will work well for you. Please check T-Mobile coverage in your area prior to purchase. These SIMs will work with any 4G T-Mobile or 4G GSM Unlocked phone only and will not work with any 3G or older phones. This preloaded SIM is a 3 in 1 SIM. It comes in standard SIM size with perforations for the micro and nano SIM sizes. Once a SIM has been activated, the SIM may not be returned. This SIM may be activated and phone numbers may be ported over on our Spartan Technologies activation portal ONLY. This plan may not be activated in any other way. Instructions and unlock code will be on the SIM. These SIMs are intended for new Lycamobile customers and porting of existing Lycamobile phone numbers is not allowed and may render the SIM void. Limited time offer. Plan expires after 30 days. Only valid for calls, texts and data usage from the US. 100MB of data at up to 4G LTE speed only. USA includes 50 states and Puerto Rico. Texts to 900 numbers are not included. Purchase of top-up credit required to enable additional features (like international talk to countries not listed). 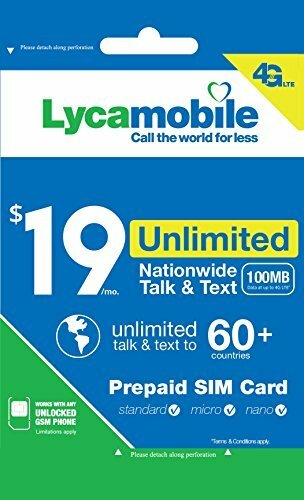 Offer of unlimited international calls to Lycamobile numbers only valid when both numbers are not roaming. No national roaming (voice, text and data not available in off-net areas - see coverage map for details). For non-commercial, personal use only. Service may be suspended/terminated if used in violation of Acceptable Use Policy. SIM and assigned number expire after 90 days of non-use. Offer terms at time of plan activation apply, regardless of purchase date. Plans, rates & services are subject to change without notice & are not available in all locations or for all phones. LTE is a trademark of ETSI. Please check T-Mobile coverage in your area prior to purchase. These SIMs will work with any 4G T-Mobile or 4G GSM Unlocked phone only and will not work with any 3G or older phones. SIM comes in standard SIM size with perforations for the micro and nano SIM sizes. These SIMs are intended for new Lycamobile customers and porting of existing Lycamobile phone numbers is not allowed and may render the SIM void. Instructions on how to activate the SIM and an unlock code will be on the SIM. Please follow these instructions. Spartan Technologies is a Lycamobile Authorized dealer. If you have any questions about this product by Spartan Technologies, contact us by completing and submitting the form below. If you are looking for a specif part number, please include it with your message.